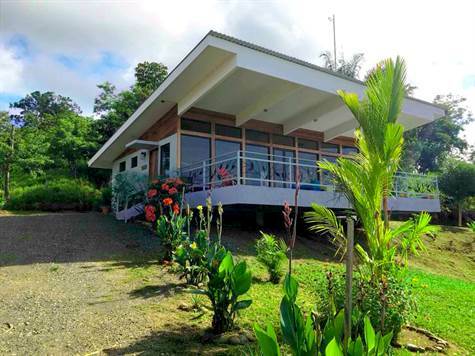 This beautifully decorated home sits atop rolling hills overlooking the beautiful beaches of Playa Esterillos on the Central Pacific Coast of Costa Rica. It has virtually everything you need to just relax and exhale all your worldly troubles as you breathe in the healthy rain forest air. As part of an intentional, regenerative and sustainable community, you can delight in living in harmony with nature and your neighbors. You'll enjoy fresh organic foods grown in your own yard as you have over two acres of privately titled land to cultivate your own garden filled with herbs, fruits, vegetables, and other exotic plant foods. From the day you arrive, you can enjoy the home's existing bounty of figs, papayas, mangoes, mangosteen, pineapples, plantains, bananas, star-fruits, avocados, basil, cardamom, and other herbs and plants, including guanabana and chocolate pudding fruit. And you have plenty of lands to expand your dream with guest cottages or rental units too. The spacious home is open concept with a large kitchen, dining area and living room with floor to ceiling sliding glass doors opening to a huge covered deck that runs the entire length of the home. Every little detail adds to a feeling of luxury and respect for the beauty of mother nature, from the custom petrified wood heart-shaped sinks in your master bathroom to the huge tiger marble farm style sink in your kitchen. You also have a beautiful custom wood dining area and hand.-crafted wooden barn doors to your bedroom and half bathroom too. The home is fully furnished with comfortable modern furniture both inside and out on your beautiful spacious deck. Your new Eco-themed dream home comes fully turn-key with dishes, pots, pans and a kitchen appointed with every modern luxury, including dishwasher, convection oven, and gas stove too. The community is very peaceful and secure set amidst rolling hills just a 15-minute drive to the beautiful beaches of Esterillos, Bejuco and Playa Bandera with dozens of restaurants and shops nearby too. You can dip in the turquoise waters of the Central Pacific or swim in your community's beautiful saltwater pool. Saint Michael's Sustainable community also has a spacious community entertainment area, plus a championship disc golf course that hosts an international tournament annually with enthusiasts from around the world. The Rancho style clubhouse has ample space to throw parties and has weddings and other events, including a large outdoor kitchen, dining area, and BBQ too. All these additional amenities are available for a small optional H.O.A fee of just $45 a month. Live the dream! Enjoy sustainable living from your own private piece of paradise nestled in the rolling hills and rainforest above the beautiful beaches of Costa Rica.